We’ve reached the half-way point in this year’s 12 Bakes of Christmas, so I thought it would be nice to return to a bit of a festive classic. I’ve made a batch of Pfeffernüsse, but have added a but of a citrus twist to them. Pfeffernüsse are one of my favourites, and I can much through a whole pile of these. Pretty miraculous for something that doesn’t even contain chocolate! This is a comparatively “easy” Pfeffernüsse recipe. Many recipes tell you to make various syrups, then let it cool, work in the flour and let it sit overnight or even for days to let the flavours develop. Not here. You can make them and bake them right away, with no need to leave it resting over night occupying valuable space in your fridge that could be chilling eggnog or champagne instead. There is only one “fiddly” bit here, which is making sure that the Pfeffernüsse are soft. This is worth doing, as it ensures that they have a good, rich flavour when you bite into them. You’ve got two choice here – add some pieces of soft bread to a tin with the baked but unglazed cookies, replacing the bread as it gets hard, until the cookies are soft, which can take a few days. Or use my cheat’s express method – I put the Pfeffernüsse on a wire tray, and then hold that tray above steam from a pan of water or a boiling kettle for a few seconds. Do this twice, then pop them back in an airtight tin. Repeat this the next day, and you should find that they have softened up nicely. To finish, I have dipped my Pfeffernüsse in icing, as they remind me of the ones you buy with their crisp, brittle icing. I used a couple of spoonfuls of Acqua de Cedro, a liqueur made with citron and like a posh version of limoncello with a sharp, citrus flavour, but you can equally use Grand Marnier or Cointreau. Now, you might be looking at these pictures and notice how amazingly white my icing looks – and it does seem just like snow! Well, the reason that it looks so brilliant is that I cheated (gasp!). I use a small dash of white food colour with the icing, so that it had that bright, snowy appearance. It doesn’t change the flavour and you can happily skip it, but in the interests of full disclosure I feel I should say that I’ve used it in case someone makes these and is surprised that they don’t look quite as white! How you flavour them is up to you – I’ve used a mixture of spices, plus candied orange peel. 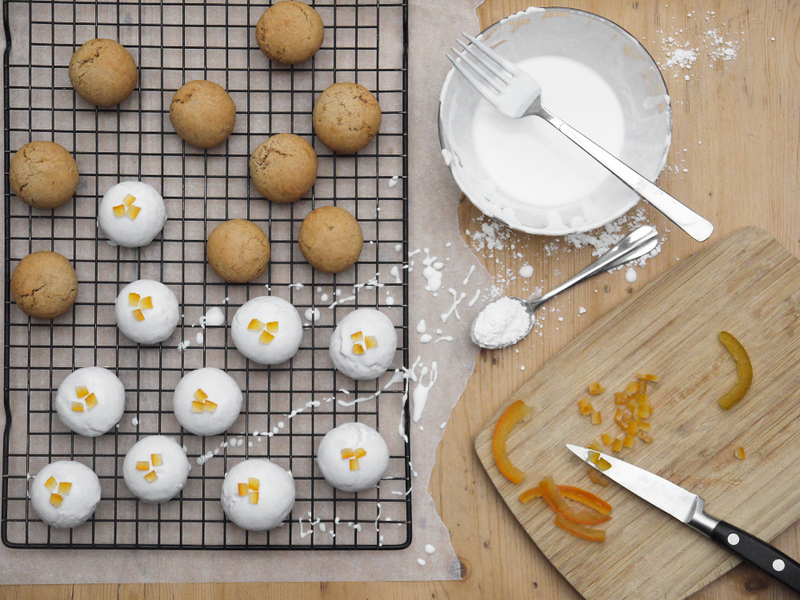 You can make these extra-citrussy with the addition of some orange zest, or get creative and go for something completely different – cardamom and lemon anyone? Or convert to the dark side…cinnamon and cloves for flavour, and then dipped in dark chocolate? Now that would be pretty sensational! 1. Put the egg and sugar in a bowl. Mix well until thick and creamy (around 5 minutes). 2. Fold in the chopped orange peel, ground almonds and spices and mix well. 3. Combine the flour and baking powder, then mix into the wet ingredients until you have a smooth dough – it will slightly sticky, but you should be able to roll pieces into balls. If too dry, add a few drops of water; if too wet, add a tiny sprinkle more flour. 5. Bake the Pfeffernüsse at 180°C for 15 minutes until golden and puffed, turning the tray half-way. When baked, remove and leave to cool on a wire rack. Transfer the cold cookies to an airtight tin and add a slice of bread – this will soften the Pfeffernüsse. Replace the bread when dry. 6. To glaze, mix the icing sugar with white colouring (if using) and enough water or liqueur to get a thick but smooth icing – think really thick double cream. Dip each cookie in the icing, shake off the excess, put some pieces of candied peel on top and leave to set. One of my favourite Christmas treats is the German Elisenlebkuchen, packed with nuts, citrus peel and spice, and the base coated in dark chocolate and finished with a sugar glaze that takes on a frosty appearance. They are pretty much Christmas in a biscuit. Now, if I’m going to dare to call these things Elisenlebkuchen, then I need to be careful what goes into them. I earn some credit for the hazelnuts, walnuts, almonds, various spices and lemon and orange peel I’ve used, but I would have scored a great big fat zero if I had let just one dash of flour get anywhere near them. As a mark of quality, these things are made wheat-free. As a result, they have a fairly flat shape, but the flavour is rich and the texture soft and dense. My fondness for these is in part due to what goes into them – nuts, spices and candied peel. However, it is also due to the fact that they are one of the first biscuits I got to know. Unlike today, when we’ve got easy access to foreign Christmas goodies, it used to take a bit of work. Panettone, marrons glacés and Lebkuchen had to be searched out, found only in places familiar to those in the know. So it was with these biscuits. The specific brand I loved were Bahlsen Contessa, and they were sold in a branch of Spar where my grandmother lived. The German woman who ran the shop had a few of them in at the end of the year, so no visit was complete without a trip to pick up a box of Lebkuchen. I liked to pick off the chocolate and then eat the soft cake bit. While there are rules about what you can use, you still have some scope to play around. Various recipes seemed to suggest using just almonds, but I wanted to add a bit more depth to my attempt, so I used equal parts of hazelnuts, walnuts and almonds. For the candied peel, I changed the common 50/50 mixture of orange and lemon, using mostly orange, and relying on fresh lemon zest to provide the zing. And finally, the spices. 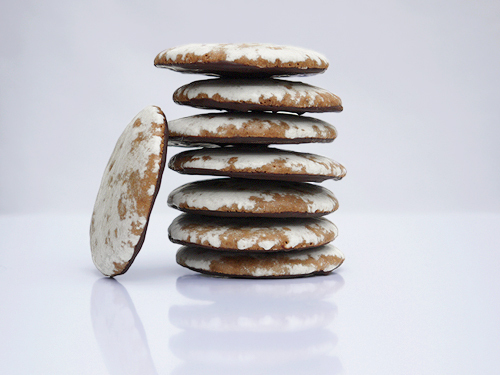 The traditional approach is to use Lebkuchengewürz (Lebkuchen spices). However, I had run out of this so I let my creativity run wild. Cinnamon, cloves, mace, ginger, cardamom, star anise and a dash of white pepper went in there. You can go with whatever you like, but I would aim for mostly cinnamon with just a dash of the more powerful spices. Also keep in mind that the flavour will mature as they are stored, getting stronger with time, so if you go with lots of really forceful spices such as cloves or black pepper, you might send your guests running to the kitchen for water. Going heavy on nutmeg, coriander or cardamom, in contrast, probably invokes less of a risk! 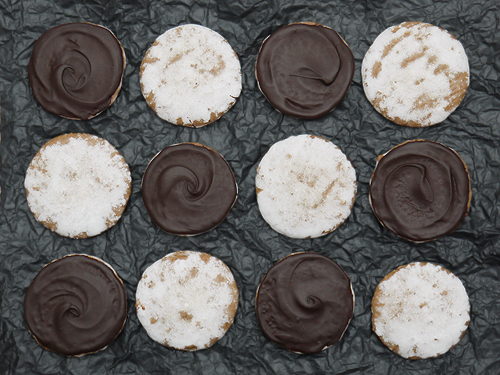 When it comes to finishing these Lebkuchen, you’ve also got a few options. They often feature whole almonds arranged either individually or in a circle on top. They can be left as they are, or coated with a simple glaze of icing sugar and hot water. This has a magical effect when you leave it overnight, taking on a white, frosted appearance. Alternatively, you can coat them entirely in dark chocolate, which works wonderfully well with the citrus and spices. I went from something that combined the two – the glaze on top, with a layer of chocolate on the bottom. If you buy these, they tend to be on the large side, around palm-sized. I made them more bite-sized. Which…arguably means…you can enjoy twice as many. I think all in all, they take a fair bit of time to make (you need to allow for overnight drying of the icing, and then fiddling about with tempering chocolate and so on) but nothing is particularly difficult and the result is really delicious. 1. Preheat the oven to 150°C (300°F). Line four baking trays with greaseproof paper, and rub each very lightly with oil. 2. Separate the eggs. In a bowl over a pan of barely simmering water, beat the yolks with the brown sugar until pale and fluffy (around 3 minutes). 3. In a separate bowl, whisk the egg whites until you have soft peaks. Add the caster sugar, and whisk on a high speed until you have a stiff meringue. 4. Fold the meringue into the egg yolk mixture in three batches. Stir in the ground nuts, crushed flaked almonds, candied peel, lemon zest, spice, salt and baker’s ammonia. 5. Transfer the mixture to a piping bag, and pipe out rounds onto the trays (I did eight per sheet – each one around 4cm diameter). 6. Bake the biscuits for 20 minutes, turning the tray mid-way through, until they are puffed up and browned. When done, remove from the oven, allow to cool and remove from the paper and cool on a wire tray. 7. Once all the biscuits are baked, make the glaze by mixing the icing sugar with the boiling water. Brush the glaze onto the domed side of the biscuits, and leave overnight to dry (the glaze should dry fairly quickly, and take on a “frosted” appearance by the next morning). 8. Finally, melt the chocolate and use to coat the flat side of the Lebkuchen. Worth making? Definitely. These taste pretty much like the pure essence of Christmas, and well worth the time they take. I realised that this year, I’ve done quite a lot of posts that require some strange/odd/niche ingredient, which is of course not great if you want to try something at home and don’t have all manner of strange powders in the house with which to perform culinary magic. Today’s recipe is one that looks very fancy, but is actually made with rather more humble ingredients (or as humble as I get in the kitchen). But just to make sure that these biscuits still look very jolly, I’ve made them using biscuit presses, and finished them with a dusting of edible gold lustre, of which more later. Rather fetching, aren’t they? These cookies are called Frankfurter Brenten. 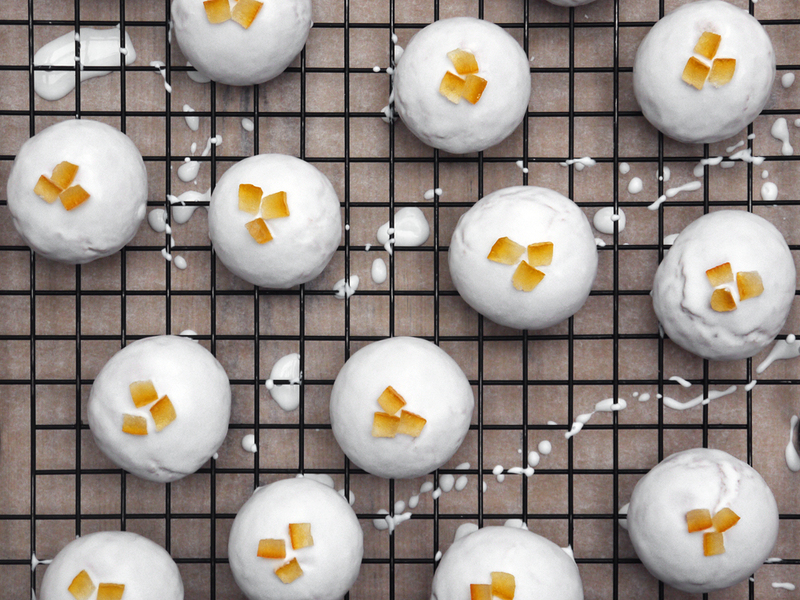 They are made from a soft dough made that contains marzipan, sugar and egg whites, plus a dash of orange blossom water. This gives you a dough that is finer and easier to mould than plain marzipan, allowing you to get some very fine details. I made these using an oak leaf motif, and I think it looks fantastic. There is something about the shape that seems very fitting for Christmas. If you want to make these cookies without using a press, then I’ve got a few suggestions. First, have a look for something in the house with a pattern – think dominoes or printing blocks. If you are at a vintage market, a Victorian block with a festive pattern would look superb (just make sure they are not made from lead, and that they don’t still have ink in them!). Alternatively, look for things with a texture that you can press onto the rolled dough, then cut out shapes using normal cutters. The only limit I found is that very tiny biscuits will puff up too much in the oven, one side will expand faster than another, and they won’t look too pretty. I think you could remedy this by baking at a very, very low temperature or just stick to making larger Brenten. Once baked, you could leave the Brenten plain, but I wanted to decorate them in gold. I though the design I had used had the look of medieval carvings, like the bosses you might see in the vaulted roofs of old cathedrals. They also reminded me of the Elizabethan marzipan tradition, and I wanted a nod back to that too. In Tudor times, a confection known as marchpane would be prepared from almonds and sugar. This mixture was bound with a little rose water, and the resulting paste could be fashioned into elaborate and intricate shapes. Think figures, pictures, fruit, swans, portraits. An essential part of the confectioner’s repertoire in those times, and essential to get right, as essentially whatever Good Queen Bess wanted in marzipan form, she more likely than not had to get, lest you wanted to risk being sent to the Tower of London. Given the ingredients, marchpane was a luxury (containing exotic almonds and sugar, out of the reach of all but the very wealthiest), and it was finished accordingly, often with real gold leaf. This was confectionery as art, and art that was intended to impress the great and the good. Now, to be clear, I have not been so needlessly extravagant as to cover these biscuits with actual gold (we’ll leave that for another day when we’re feeling a little more flush with cash, which after holidays we are most certainly not) but to get a similar effect, I finished them off with a light glaze made with edible gold lustre dust, and then brushed some more of the dust of the details to produce almond confections that glow warmly under the Christmas lights. On a black plate next to the Christmas tree, they looked stunning, and almost too good to eat. So…feeling a little festive now? Now, for all of this splendour, how to they taste? The flavour is clearly strongly of almonds. I used quality (high almond) marzipan, but the result of the mixing and the baking is that the almond flavour seemed even more intense, which I loved. They are also incredibly rich, even ignoring that they are covered in what looks like gold, and they have a read wow factor. I look at them, and think wow! They’re a good biscuit to keep nibbling over a long period of time, not one to be wolfed down in seconds. The texture was a little surprising. I thought they would be soft and slightly chewy, but I could not have been more wrong. They are dry-ish and firm, but have a slight crumble while eating. I think this texture is due to their size, shape and the fact I left them overnight to cure so that the surface would be dry and the details sharp. If you were to make smaller Brenten that were more cube or sphere-like, then I expect the texture would be different. But then, they would not look as truly awesome as these golden delights! 1. Mix the flour and icing sugar in a bowl. Grate the marzipan coarsely into the icing sugar. Mix briefly then rub the mixture with your fingers until it resembles coarse breadcrumbs. 2. Add the orange blossom/rose water and the egg white. Mix with your hands until you have a smooth dough. Wrap the dough in cling film and chill for one hour. 3. Now shape the cookies. Dust a work surface with icing sugar, and roll out the dough to 1cm (1/2 inch) thickness. If using a cookie press, dust the top of the dough with icing sugar, then press away(**). If using a cutter, just cut out shapes. Trim the edges of the cookies, and transfer to a baking sheet lined with greaseproof paper. 4. Leave the cookies to dry, uncovered, for at least 3 hours, or as long as 24 hours. 5. To bake the Brenten, preheat the oven to 135°C (275°F). Bake the Brenten for 15-20 minutes until the “peaks” of the details are slightly browned. If you want to keep them white, place an empty baking tray on the shelf above during baking. 6. If you want to gild the Brenten, mix 50g of icing sugar with 2 teaspoons of water. Add some gold luster dust, and paint the surface of the cold Brenten. Leave to dry, then dust with the gold dust again. Job done! (*) This means the water with a mild flavour. If you’ve got very intensely flavoured extracts, then dilute them one part flavour to three parts water. Otherwise the flavour is too strong, and it will be like eating perfume! (**) Remember that as you press, the dough will be pushed out. It might be easier to cut the dough into pieces to match the press, then do the pressing, so that you don’t distort the images as you go. Worth making? This is the sort of Christmas bake that you will adore if you are a fan of Marzipan. It’s also super-easy to make and the ingredients easy to get hold of. You can also make life easier by just shaping the dough by hand and making patters with forks that would look equally good. Pop the baked cookies under a very hot grill for 10 seconds or blast with a blowtorch for some extra browning on top! I’ve done a few posts recently that involve the magic powder of the kitchen, baker’s ammonia. It’s fun to use as it gives off a blast of ammonia fumes during baking (OK, not fun, but quite dramatic), and produces amazingly light baked goods. Once I managed to track in down in London (hint – it’s in Scandinavian Kitchen near Great Portland Street), I looked around to see what I could use it in, and quickly came across one of the most fancy biscuits I’ve ever seen, German Springerle. These are made from an aniseed-flavoured dough, and the biscuits are formed into intricate designs using presses, resulting in some very fancy shapes indeed. They are then left to cure until to surface is dry, and then baked to get the baker’s ammonia going. At this point, the cookies expand dramatically, jumping four to five times in height. I’m not going to write too much more about Springerle here, as I’ve written all about them in a guest post at All The Live Long Day, so I’ll let you read that at your leisure. It also has some links to where you can get hold of the special biscuit presses that you need to make Springerle as well as some ideas of how to make patterns with things you may have at home if you lack the patience to track down the specialist tools. However, I will share some of my experiences for making these cookies if the mood should take you. The recipe I used (set out below) is easy to make, and rolling out the dough presents no challenges. However, I found it tricky to get the moulds properly covered in flour to make sure that the imprint was sharp and, eh, the mould was not covered in the dough. A few attempts ended fruitlessly, with me scrubbing the mould out with a toothbrush, then waiting for it to dry before I could have another attempt. So had I wasted my time and money? Well, no. A simple trick solved this problem – it wasn’t necessary to get the flour into the mould, as long as you had a barrier between it and the dough. So I dusted the top of the rolled dough with flour, and voila – perfect impressions of flowers, cocoa pods, houses, harps and abstract designs. Another tip that makes life easier is to cut the dough into pieces once it has been rolled, and then press with the moulds. When you press down, the dough at the edges gets pressed out slightly, so if you just use one giant piece of rolled dough, you can get some distortions. Use individual pieces – no problems! Then all you need to do is trim the edges, and re-use the scraps to make more cookies. Once all the cookies has been pressed, they need to sit out for around 24 hours until the surface is dry and they look pale. I tried experimenting with a few different sizes – some very small biscuits (the side of a two pence coin) and some very large ones the sizes of playing cards. Against my expectations, when the Springerle are too small, they warp in the oven and go lop-sided. In contrast, the larger ones puff up evenly. I had expected the larger ones to be prone to cracking, but this proved not to be a problem. So it seems to me that going for large, intricate designs if the way forward. As you can see below, after baking, the Springerle keep their shape remarkably well. There is a bit if puffing up at the edges, but the designs themselves are almost unchanged. The only thing you need to watch during baking is that they should remain pale. Watch them carefully to make sure that they don’t brown. Once baked and cooled, I tentatively tried one of my Springerle. I’m happy to report that for all the hard work involved (and let’s be honest, there is a lot of hard work involved in these things), they taste delicious. Light, slightly chewy and aromatic from aniseed. There’s a tiny hint of lemon in there too, just to enhance the aniseed, but not so much as to over-power it. They really make an unusual addition to the festive table. Springerle are also noted as a biscuit that gets better if left to cure after baking. They should be stored in an airtight tin, but if they seem too dry, just add a piece of apple or a slide of bread to the tin (be careful to check in from time to time – no-one is a fan of mouldy apple…). This seems to be a common trait among biscuits made with baker’s ammonia – they all seem to get better it allowed to sit for a while. And finally, just in case you are curious about the various patterns that you can find, in addition to the big tray above, I also got hold of this rather jolly pine cone pattern. They were also left to dry for 24 hours, and the baked versions retained the pattern with pin-like sharpness. 1. Dissolve the baker’s ammonia in the water, and leave to one side. 2. In a large bowl, beat the eggs until pace and fluffy, around 10 minutes. Add the icing sugar in thirds, beating well after each addition, then add the softened butter and beat until combined. Add the baker’s ammonia mixture, the salt, aniseed extract and lemon rind. Mix well. 3. Start to add the flour to the egg mixture. Once the mixer gives up, add the rest of the flour, and use your hands to combine everything until you have a stiff dough. 4. Take portions of the dough and roll out on a well-floured worksurface. Aim for 1/2 cm or 1/4 inch. Sprinkle the top lightly with flour (a tea strainer is the ideal way to sprinkle the flour), then use your press to make the pattern. Trim the edges of the cookies, then transfer to a baking tray lined with greaseproof paper. 5. Leave the cookies to dry, uncovered, for 24 hours. 6. Preheat the oven – at this stage, it’s an art rather than a science, so it’s best to test with one cookie to make sure they don’t burn. The temperature should be 120° to 160°C (255° to 325°F) – the test cookie should puff up from the base. The bottom should be barely coloured, and the top should not be starting to brown. Allow 10-20 minutes, depending on the size of the cookie. (*) Be careful what you use – my aniseed extract had the strength of aniseed liqueur. If you’ve got something stronger, such as pure oil, you may need less – a lot less! Worth making? I’m really glad that I finally got the chance to make Springerle. Sure, they are fussy, tricky and take a lot of time, but they taste great and have a wonderful traditional flavour. Worth trying if you’ve got the time, patience and inclination.